ROUND 3: Mayo 0-13 Leitrim 1-10 (MacHale Park, 10/1/2018). MAYO: Paddy O’Malley; Marcus Park, Ger McDonagh, Aidan Butler (0-1); James Stretton, Shane Nally, James McCormack (0-1); Barry Moran, Jordan Flynn; Fionn McDonagh (0-1), Neil Douglas (0-1), Nathan Moran; Ross Egan (0-1), Alan Freeman (0-2, frees), Ciaran Treacy (0-3, two frees). Subs: Jason Gibbons (0-1) for Barry Moran, Adam Gallagher (0-1) for Fionn McDonagh, Oisin McLaughlin for Egan, Peter Naughton (0-1) for Freeman, Matthew Ruane for Flynn, Kevin McLoughlin for Nally. ROUND 2 (refixed): Mayo 1-9 Galway 1-10 (MacHale Park, 12/1/2018). MAYO: David Clarke; Steven Duffy, Kevin Keane, Jamie Oates; Michael Plunkett, Michael Hall, Shairoze Akram; Adam Gallagher, Jason Gibbons; Shane Nally (0-2), Kevin McLoughlin (0-3, one free), Matthew Ruane; Ryan O’Donoghue, Brian Reape (0-4, three frees), Peter Naughton (1-0). Subs: Diarmuid O’Connor for Nally, Ger McDonagh for Ruane, James Stretton for Akram, Fionn McDonagh for Gallagher. ROUND 4: Roscommon 0-14 Mayo 0-11 (Dr Hyde Park, Roscommon, 14/1/2018). 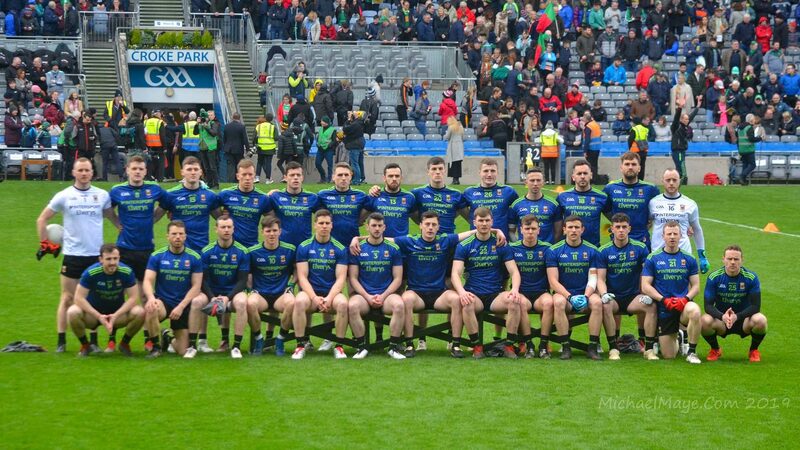 MAYO: Robbie Hennelly; Eoin O’Donoghue, Ger Cafferkey, Caolan Crowe; Colm Boyle, Paddy Durcan (0-1), James Stretton; Stephen Coen, Danny Kirby; Fionn McDonagh (0-4, two frees), Diarmuid O’Connor (0-1), Conor O’Shea (0-1); Neil Douglas (0-1), Jason Doherty (0-1, free), Ciaran Treacy (0-2). Subs: Kevin McLoughlin for O’Connor, Jason Gibbons for Boyle, Shairoze Akram for O’Shea, Peter Naughton for McDonagh, Jamie Oates for Crowe, James McCormack for Kirby. ROUND 5: Mayo 1-10 Sligo 0-11 (James Stephens Park, 21/1/2018). MAYO: David Clarke; Brendan Harrison, Ger Cafferkey, Eoin O’Donoghue; Colm Boyle, Michael Hall, Paddy Durcan (0-1); Jason Gibbons, Stephen Coen; Kevin McLoughlin, Aidan O’Shea (0-1), Diarmuid O’Connor (0-1); Jason Doherty (1-4, four frees), Evan Regan (0-3, two frees), Andy Moran. Subs: Fionn McDonagh for McLoughlin (blood), Conor Loftus for O’Connor, Shairoze Akram for Durcan, Shane Nally for Coen, Ger McDonagh for Gibbons, Fionn McDonagh for Doherty. SEMI-FINAL: Mayo 1-24 Leitrim 1-3 (MacHale Park, 9/6/2018). MAYO: Patrick O’Malley (0-1 a ’45), Rory Brickenden, Brian O’Malley, John Cunnane, Paul Lambert, Oisín Mullin, Cathal Horan (0-1), Jordan Flynn, Evan O’Brien (0-1), Nathan Moran, Ryan O’Donoghue (0-1), Oisin McLaughlin (1-1), John Gallagher (0-1), Ross Egan (0-12, six frees), Tommy Conroy (0-3). Subs: Johnny Maughan, Seán Óg Tigue (0-1), Colm Moran (0-2), Joe Dawson, Donovan Cosgrave. FINAL: Roscommon 1-6 Mayo 3-16 (Dr Hyde Park, 17/6/2018). MAYO: Patrick O’Malley (0-1, a ‘45); Johnny Maughan, Brian O’Malley, John Cunnane; Paul Lambert (0-3), Oisín Mullin, Cathal Horan; Jordan Flynn, Evan O’Brien (0-1); Nathan Moran, Ryan O’Donoghue (1-0, penalty), Oisín McLaughlin; Conor Diskin (1-0), Ross Egan (0-8, six frees), Tommy Conroy (1-0). Subs: Colm Moran (0-2) for McLaughlin, Joe Dawson for Mullin, John Gallagher for Conroy, Stephen McGreal (0-1) for Diskin, Sean Óg Tigue for O’Brien, Brian O’Neill for Cunnane. SEMI-FINAL: Mayo 2-14 Derry 2-11 (Páirc Seán Mac Diarmada, Carrick-on-Shannon, 14/7/2018). MAYO: Paddy O’Malley; Johnny Maughan, Brian O’Malley, John Cunnane; Paul Lambert (1-1), Cathal Horan, Oisin McLaughlin (0-2); Evan O’Brien (0-1), Jordan Flynn; Nathan Moran (0-1), Ryan O’Donoghue (1-0), Tommy Conroy (0-2); Conor Diskin (0-1), Ross Egan (0-5, frees), Colm Moran. Subs: John Gallagher (0-2) for Colm Moran, Joe Dawson for Horan (black card), Seán Og Tigue for Nathan Moran (black card). FINAL: Kildare 1-18 Mayo 1-16 (Croke Park, 5/8/2018). MAYO: Patrick O’Malley (0-1, ’45); Johnny Maughan, Brian O’Malley, John Cunnane; Paul Lambert, Cathal Horan, Oisin McLaughlin (0-1); Evan O’Brien (0-1), Jordan Flynn; Nathan Moran, Ryan O’Donoghue (1-2, one free), Tommy Conroy; Conor Diskin (0-1), Ross Egan (0-7, frees), Colm Moran (0-3). Subs: Joe Dawson for Maughan, John Gallagher for O’Brien, Liam Hughes for Conroy, Stephen McGreal for Moran, Sean Og Tigue for Horan (black card). ROUND 1: Mayo 4-20 Leitrim 1-8 (MacHale Park, 2/5/2018). MAYO: Ronan Connolly; Seán Holmes, Eoghan McHale, Aidan Cosgrove; Ruairí Keane, Liam Óg Horkan, Conor Dunleavy (0-1); Jack Carney (0-2), Harry Burke (0-2); Frank Irwin, Ultan O’Reilly, Lee Traynor (0-4); Martin Ball (0-4), Fionnan Ryan (2-1), Enda Hession (2-5, penalty goal and three frees). Subs: Luke Dawson for Holmes, Fergal Sweeney for O’Reilly, Evan Ivers for Keane, Ciaran Mylett (0-1) for Burke, Ethan Henry for Irwin, Paddy Heneghan for Hession. ROUND 2: Roscommon 4-12 Mayo 0-11 (Kiltoom, 11/5/2018). MAYO: Ronan Connolly; Seán Holmes, Eoghan McHale, Aidan Cosgrove; Ruairí Keane, Liam Óg Horkan, Conor Dunleavy (0-1); Jack Carney, Harry Burke; Frank Irwin (0-1), Ultan O’Reilly, Lee Traynor (0-1); Martin Ball (0-1), Fionnan Ryan, Enda Hession (0-6, four frees). Subs: Evan Ivers for Traynor, Ethan Henry for O’Reilly, Luke Dawson for Holmes, Liam O’Donoghue for McHale, Ciaran Mylett for Burke, Peter Timlin for Ivers. ROUND 3: Mayo 2-18 Sligo 0-10 (MacHale Park, 23/6/2018). MAYO: Ronan Connolly; Alfie Morrison, Luke Dawson, Seán Holmes; Evan Ivers, Conor Dunleavy (0-1), Aidan Cosgrove; Jack Carney (0-1), Frank Irwin; Liam O’Donoghue, Jack Mahon (0-2), Liam Óg Horkan; Martin Ball (0-1), Ultan O’Reilly (1-3), Enda Hession (0-4, one free). Subs: Lee Traynor (0-1) for Horkan, Fergal Sweeney (0-1) for Ball, Fionan Ryan for Mahon, Ciaran Mylett (1-3) for O’Reilly, Oisin Phillips for O’Donoghue, Conor Calvey (0-1) for Hession. ROUND 4: Galway 0-15 Mayo 1-9 (Tuam Stadium, 29/6/2018). MAYO: Ronan Connolly; Alfie Morrison, Luke Dawson, Seán Holmes; Evan Ivers, Conor Dunleavy, Liam Óg Horkan; Jack Carney, Frank Irwin (0-1); Liam O’Donoghue, Jack Mahon (1-0), Aidan Cosgrove; Martin Ball (0-4), Ultan O’Reilly (0-3, two frees), Enda Hession (0-1, free). Subs: Lee Traynor for Mahon (blood), Ruairi Keane for Ivers, Lee Traynor for Mahon, Fionan Ryan for Horkan, Ciaran Mylett for Keane, Eoghan McHale for Cosgrove (blood), Fergal Sweeeny for O’Reilly (blood) and for Dunleavy, Conor Calvey for Hession.